A food blog mostly about traditional Kerala recipes. 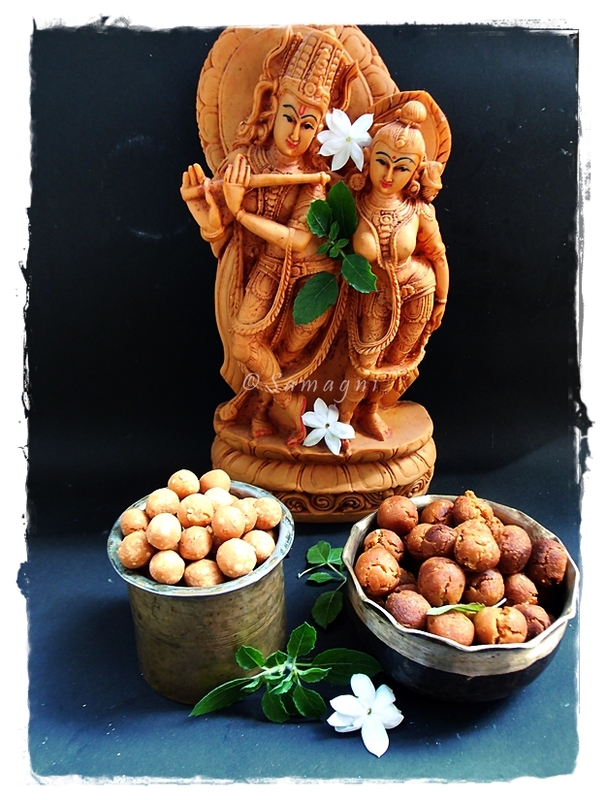 Salt Seedai / Cheedai as well sweet cheedai is made during Gokulashtami as a Naivedyam to Lord Krishna. Sweet cheedai is slightly tricky to get right. If your proportions are not right, they might break apart while frying. But using the proportion mentioned below you can make good sweet cheedai. Vellai cheedai are crispy but soft to bite into as opposed to salt cheedais that are dense and hard to bite into. Dry roast the raw rice flour until the raw smell of the rice goes away and you get a nice roasted aroma. Remove from fire and sieve to ensure that the powder is fine and no lumps are present. Dry roast the urad dal until the dal turns pink. Remove from fire and pulse in a mixer to a fine powder. Sieve the urad dal flour twice to ensure that you take only the fine powder and you discard the coarse powders. Grind the grated coconut to make a coarse paste. It is okay even if the coconut is not fully ground. You may add small quantities of water while grinding. Add the grated jaggery powder to a pan and mix few spoons of water. (Be careful about the amount of water. Do not dilute it too much). Place on low fire to let the jaggery melt. Once melted, use a strainer to sieve any lumps/impurities. Mix a tablespoon of sieved, finely powdered urad dal flour along with the sieved rice flour. Add the ground coconut, jaggery syrup, butter, and sesame seeds to this. Use your fingers to mix the flour and jaggery well. Add small quantities of water if needed to make a dough. The dough should be soft but not loose. Take a small portion of the dough, place this dough on your left hand and use the long three fingers on the right hand to roll the dough into marble-sized balls. Place them on a paper. It is recommended that you allow this to dry a bit before you deep fry them. Heat oil in an iron kadai. Once the oil is hot, gently and carefully drop a batch of the marble-sized dough balls into the oil. Ensure that the balls are fully immersed in oil. Retain the fire in medium in the beginning for about a minute. You will notice a lot of bubbles during this time. When the bubbles reduce, lower the fire and stir often until the balls change color to golden brown. Use a strainer ladle to remove the cheedai from the oil. Place on an absorbent paper to absorb excess oil. Store in an air tight container once it cools down. 1. Sieve the flour at least twice to ensure that the rice flour and urad dal flour used is finely powdered. This will ensure there are no accidental oil splashes while frying the cheedai. 2. Although it is recommended that the rolled cheedai balls should dry off a bit before they are deep fried, you need not roll the entire dough into balls and then start the frying process. You may roll enough for 2-3 batches, start frying batch by batch and as you are frying, you may roll new batches of cheedai. 3. Use a thick bottomed iron kadai for frying to ensure uniform heating. 5. Due to the jaggery in the dough, vella cheedai tends to turn black in excess heat. Be careful about the amount of heat or you will end up burning the cheedai. 6. Vella cheedais are not as crispy as salt cheedai. The outer crust will be crisp but inside may be a little chewy. 7. Following the proportions and instructions right is key to getting this right. 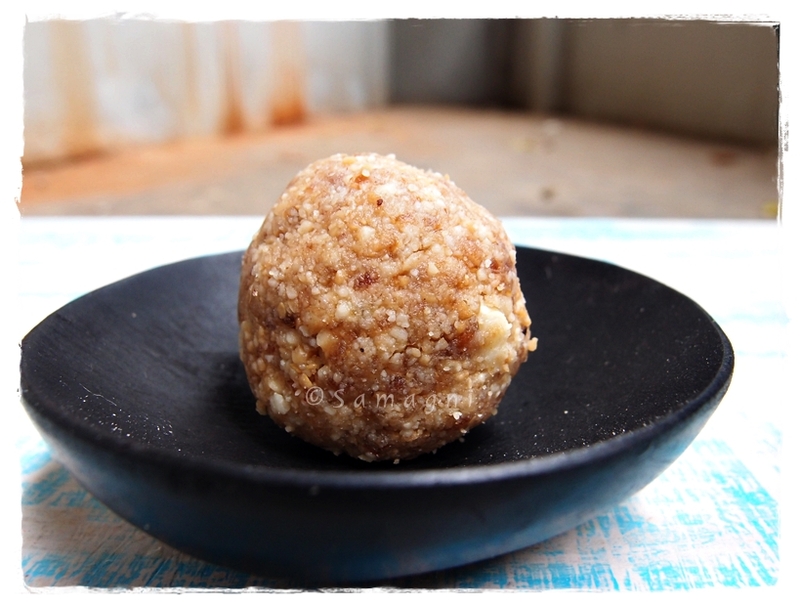 Doubt if there can be a simpler, healthier, and tastier laddoo than this one. It is protein-rich and sugar free. I learnt this recipe from a Gujarati friend who is a very big mungphali/singdana/peanuts fan. Natural sweetness of dates, flavor and crunchiness of peanuts with a hint of salt, made with just two ingredients. Lightly roast the roasted peanuts. You may add ghee if you prefer but it is enough to just dry roast the peanuts because the oil from the peanut is sufficient to make the laddoos. Although the peanuts are roasted, it is good to roast them again just before making the laddoo. When the peanuts cool down, remove the skin, put in a mixer jar, and grind to a coarse powder. Keep aside. Dry roast the sesame seeds until they start leaving an aroma and popping up (roughly 5 mins on medium fire). Check the seedless dates carefully to ensure that there are no hard parts or seeds present. Add the seedless dates into the mixer jar and grind to a smooth paste. Add some part of the coarsely ground peanuts into the mixer and grind a little along with the dates mixture to blend both the ingredients. Remove this mixture from the jar and mix well with the remaining coarsely powdered peanuts. Add the roasted sesame seeds to this mixture. I do not prefer to pulse the sesame seeds in the mixer as I like to the taste of biting into the roasted sesame seeds. Mix all the ingredients well and break lumps, if any. Taste a little of the mixture and blend and add more dates if you prefer more sweetness. Take handful of the mixture and shape into laddoos. Store in an airtight container. Will stay good up to 10 days. They taste very similar to Snickers yet totally sin-free. Even a “dates-hater” like me is unable to stay away from snacking frequently on these. Notes: I used 200 gms salted peanuts and 200 gms unsalted peanuts. So there was a hint of salt in the laddoo just to balance the sweetness. I have tried experimenting with unni appam batter by adding different types of flour and other ingredients like jack fruit jam (chakka varatti). Most of the times the experiments turn out really yum. Very rarely, some ingredients could make the appams too soft and cumble easily when you fry them or make them too hard. So yes, you could boldly experiment with the unni appam batter with a very high success rate! This time, I added various types of flour to appam batter and the results were amazing. Here is my version of multigrain unni appam recipe. The different types of flour are optional and you could choose to omit depending on availability and personal choice. Mix the jaggery in 1/2 cup of water and bring it to boil. Remove from fire when all the jaggery pieces have melted. Strain and keep aside. Peel the banana, mash, and mix it in jaggery syrup (you could even blend it in a mixer to ensure smooth consistency). Add all flours into the jaggery syrup. Add little amounts of water if required and stir. The batter should be of the consistency of idli batter. Cut the coconut into small pieces, and roast in ghee until the edges start to turn golden brown. Add this to the unni appam batter along with sesame seeds and powdered cardamom. Mix well and let the batter rest for a couple of hours. You can adjust the quantity of jaggery to the sweetness level you prefer. Instead of rice flour, you can soak raw rice in water for 3-4 hours, drain the water and grind it to a smooth paste using very little water and use it. Ragi is a very important grain in Karnataka and is used in daily cooking in a variety of forms. Popped ragi flour is available in Karnataka markets. You can substitute this with normal ragi flour. You can use sunflower oil to make unni appam but using ghee or coconut oil gives it an authentic taste and flavor. Place the unni appam mold (paniyaram pan) on fire and add ghee/coconut oil. When you start getting the smell of oil/ghee, turn fire to medium. Pour spoonfuls of batter into each pit. When the sides turn golden brown, turn over the unni appam. Keep turning the unni appams in between, till you get a dark golden brown color on both sides. Remove from oil, and drain on kitchen towels/tissue paper, and serve. Another stuffed vegetable that is very similar to the previous one. I have always been a brinjal fan. Isnt it one of the prettiest of vegetables? What a color! When I buy sarees for my mother, I always look for the aubergine or the brinjal flower color because that’s her favorite! Man has not yet mastered the art of replicating the colors of Nature very well, yet we take pride in saying that we came close. Whether it is the purple brinjal or the unique green long brinjal variety, the streaked purple and white ones, or the ivory white one; all taste excellent when cooked with the right ingredients. Who can resist the smell of the smoky bhartha baingan? Stuffed brinjal is easy to make and makes good accompaniment for rotis or puris. You can go crazy with your imagination and use anything you fancy for the masala of this recipe. Make this one and you will fall in love with brinjal. Please make sure that you use the small purple brinjal variety to make this dish. Wash the brinjal and pat them dry using a cloth. Make slits that cross each other while keeping the stem intact. Ensure that there is no dirt/worms. Keep aside. Peel and cut the onion. In a pan, dry roast the grated coconut / copra and peanuts. Set aside. Add one tbsp oil and add chopped onion, garlic, tamarind and saute well. After the onion turns pink, add turmeric power, chilly powder, jaggery, and salt. You may add anything you fancy, like coriander powder, garam masala, or ginger garlic paste instead of garlic. Turn off the flame and let the mixture cool. Grind this to a fine paste in a blender. Add just enough water so that the paste is not too loose. Carefully stuff this paste into the slit brinjal so that the paste of masala coats the insides of the brinjal. If you choose to and have the time and patience, you can keep this aside for half an hour before you start cooking the brinjal. I did not do this and cooked the stuffed brinjal straightaway after stuffing them with the masala. In a thick bottomed pan, pour 2 tbsp of cooking oil and place the slit brinjal with masala stuffing. Close with a lid. Hold the brinjal stem and turn them over occasionally to cook all sides until the brinjal is tender (about 10-15 minutes on medium fire). If you prefer some gravy for the dish, you can make the masala slightly watery and that will make the dish watery. If you prefer it tangy, you can cook the stuffed brinjal in tomato puree. When the brinjal is tender, remove from fire, and add chopped coriander leaves. Serve with rotis or warm rice. If you enjoyed reading this recipe, please consider subscribing to this blog. It’s free and you will receive e-mail notifications with each updation. Most South Indian households stock up on beaten rice. When an unexpected guest arrives, beaten rice flakes come to your rescue. You can make delicious items out of this inexpensive item, like upma, cutlet, a sweet, or even payasam (kheer). Kanda (onion) poha and batata (potato) poha are favorite Maharashtrian breakfast items made using beaten rice flakes. Kanda poha is moistened poha cooked in a tadka of sauteed onion sprinkled with coriander leaves, some lemon juice, and a few peanuts – definitely a wholesome breakfast. When my friend came to visit, she brought along with her some organic beaten rice flakes. My mother makes sweet beaten rice flakes often and it is a favorite in our household. It is a common neivedyam (offering to God) and a favorite of Lord Krishna. I suggested to my friend that we use the organic variety to make the sweet beaten rice. I shared with her my mother’s method of making aval nanachathu. Though Kerala is a small state as compared to other states in India, you will find difference in taste of food every 100 kms or so. Right from the chutney, sambar, and the type of rice served, to the kind of items served in a sadya, recipes and tastes differ across the length and breadth of this blessed little state. My friend’s sweetened beaten rice recipe differed from my mother’s. I told her to teach me her version which is called Aval Vilayichathu. Does anyone know the difference between aval vilayichathu and aval nanachathu? Here is the recipe to her version. Put the jaggery pieces in water and melt it on low flame. Strain the solution into a wide pan. Keep this pan on medium fire and let the jaggery solution thicken. When the jaggery solution thickens to a syrup. Check for one-thread consistency (take a drop of the jaggery solution in a spoon. Let it cool a bit and then touch it with a clean forefinger and then touch your forefinger and your thumb together and pull them apart gently. If the solution forms a thread between your two fingers, then it has reached thread consistency). Add grated coconut and stir. Add the beaten rice flakes, mix, and cook over a low flame, stirring constantly to coat the beaten rice with jaggery and coconut. Add cardamom powder. When the mixture thickens, turn off the fire. In a small pan, heat ghee. When it is hot, add chana dal and roast them golden brown. Remove the chana dal from ghee and add to the sweetened beaten rice flakes mixture. Add sesame seeds to the hot ghee and roast lightly. Be careful not to burn the seeds. Pour the ghee and sesame seeds on to the sweetened beaten rice flakes mixture. Mix well. This can be stored in the refrigerator for a month. You can take out required quantities and steam or warm in a microwave and use. Below is my mother’s version, which is simpler. This one stays good only for a day. Sprinkle small quantities of water on the beaten rice and use your hand to mix well and moisten the beaten rice. Close with a lid and keep aside. Put the jaggery pieces in water and melt it on low flame. Strain the solution into a wide pan. Keep this solution in the pan on medium fire and let the jaggery solution thicken. When the jaggery solution thickens to a syrup. Check for one-thread consistency (as mentioned earlier). When the jaggery solution reaches thread consistency, add the moistened beaten rice flakes and stir well to coat the beaten rice flakes with the jaggery syrup. Add grated coconut and cardamom powder and mix well. You can add ghee if you choose to as this tastes good even without the ghee. Yet another method of making sweet beaten rice is to just scrape/powder the jaggery pieces and mix it well with the poha. Use some amount of warm milk or water to moisten this mixture. Add grated coconut and a quick and yummy snack is ready. A quick and healthy salad, simple and easy to make. Grated raw papaya, seed-ridden green chilies finely chopped, generous sprinkle of sesame seeds (may be some crushed flavored peanuts as well! ), dash of lime and salt. Yummy salad is ready. P.S. – Could use partially cooked papaya if raw gets to you!